The Army of the Guardians of the Islamic Revolution have used the social network to make public their plan to attack enemy ships in the Strait of Hormuz. 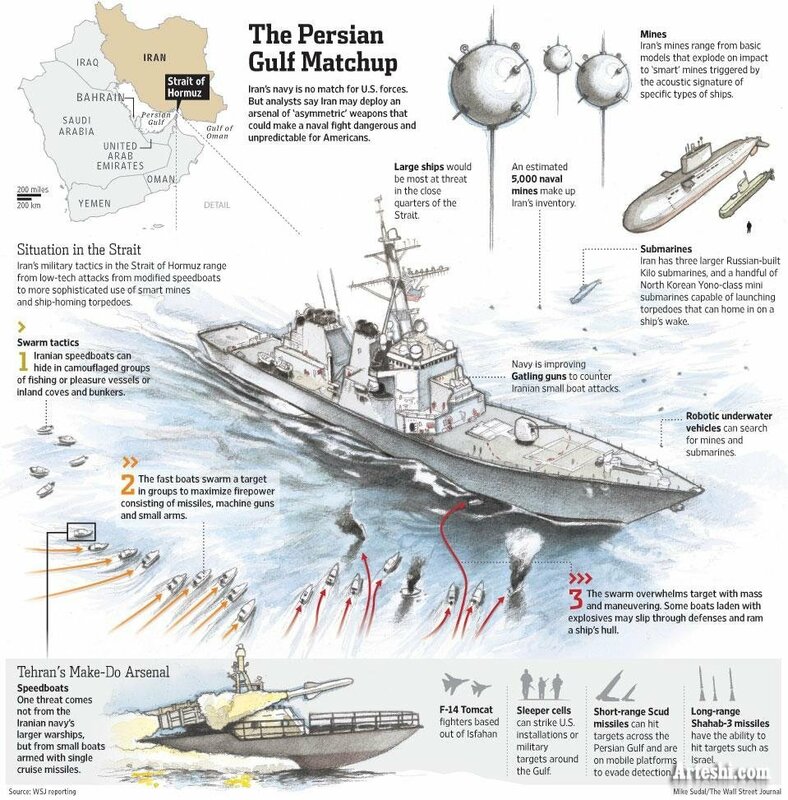 The IRGC (Islamic Revolutionary Guard Corps), the branch of Iran’s military whose role is to protect Tehran’s Islamic system, have published on Twitter an interesting drawing showing how they imagine an attack to an enemy warship entering the Persian Gulf. The plan is use several different weapons systems in a coordinated attack opened by high speed boats, used to create a diversion. 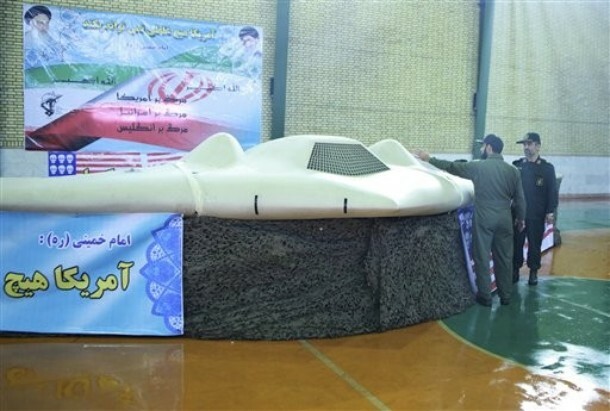 According to Good Morning Iran blog, that translated the text accompanying the rendering, the plan assumes that Iranian high speed boats, equipped with missiles and mines, and disguising themselves as normal fishing boats, would carry out an initial attack against the enemy ship. While facing the boats, the U.S. warship would be attacked by Iranian submarines, baked by IRIAF (Islamic Republic of Iran Air Force) warplanes, including some F-14 Tomcat jets with indigenous modifications (most probably providing some sort of air superiority in the vicinity), followed by ballistic missiles. The latter could be the two types showcased during an exhibition held by the IRGC on May 11. The new home-made ballistic missiles, an upgraded version of the solid-fuel, supersonic Iranian anti-ship missile dubbed Persian Gulf equipped with a 650-kg warhead, are dubbed Hormuz 1 and Hormuz 2. 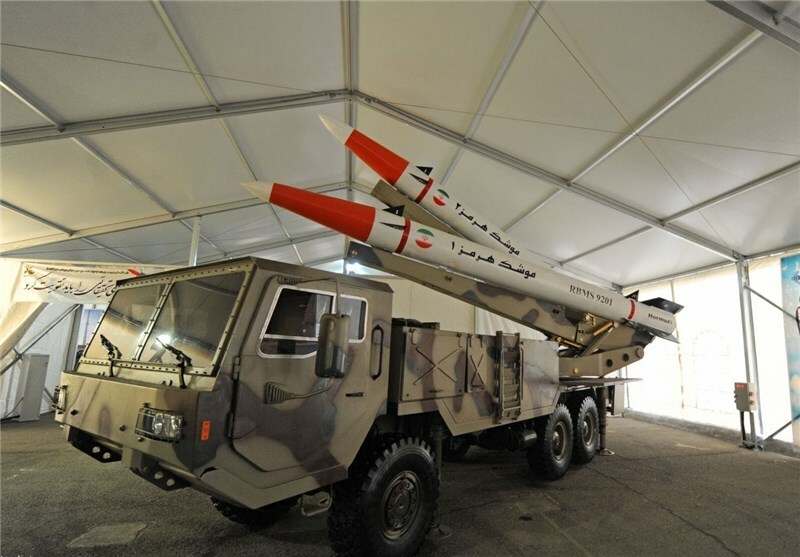 Both missiles are believed to be more powerful than the Persian Gulf, with the Hormuz 1 being an anti-radar missile with a range of 300 kilometers. That said, the plan is obviously quite optimistic, as it considers a U.S. warship as an isolated unit, whereas the latter may operate within a large, powerful and very well defended Carried Strike Group, which includes an aircraft carrier, destroyers, supporting vessels and, often, a nuclear submarine, whose task is, among the others, to defend the Group from underwater attacks. Anyway, the plan and the mock aircraft carrier being built by Iran are a sign Tehran is focusing on developing tactics to defeat the U.S. Navy in the Gulf. Not an easy task though. A reader has found that the image posted by the Pasdaran on Twitter is an infographic posted in the past by the Wall Street Journal. IRGC replaced the English text with Farsi: therefore, even if it’s not their original work, the fact they translated and published it on Twitter means they consider it accurate and most probably coherent with their plan. The “USS Enterprise fired upon enemy fighters” story: why attacking a U.S. aircraft carrier with four (or more) combat planes would be a suicide.